There are often bits and pieces that I want to share but that I don’t get around to blogging by themselves for one reason or another, so I’ve decided to do a “Bumble Bulletin” to bring all the snippets together and get some bits off my “to blog” list. There’s efficiency for you. Keen Nutrition sent me some of their nut butters to sample a few months ago- the pecan and maple one was my favourite, soo mapley. Check them out on twitter and now on their website. 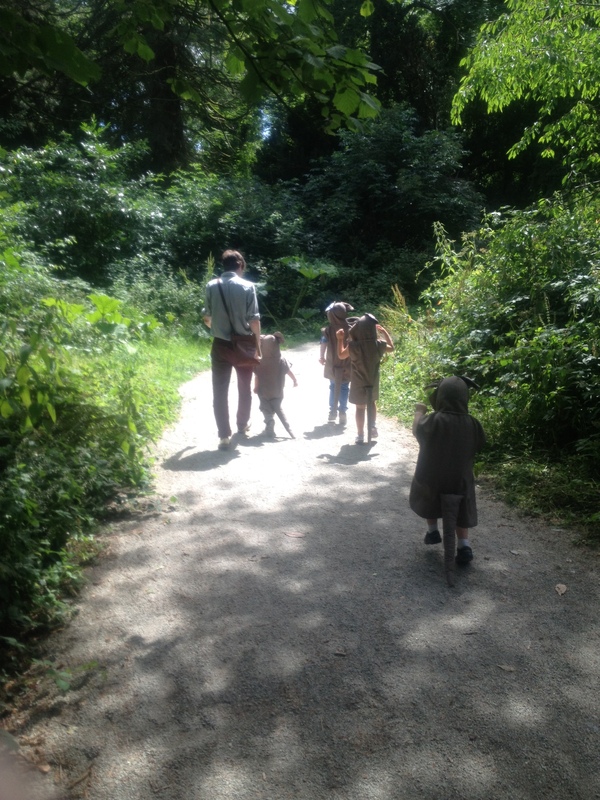 My love of the Gruffalo is well documented so when we (OK, the boys) were invited to our lovely neighbour’s Gruffalo Birthday Party at Wells House– we were delighted. It was a really magical affair, the kids were all dressed up in mouse costumes and mouse whiskers painted on their faces painted, and they were led by Luke for a stroll through the deep dark wood and then back to a private room for a birthday party, and on to the playground for a good play (demoused). Highly recommended. Oishii Sushi sent me a lovely (huge) platter of sushi to try after I tweeted that I’d tried their duck sushi when trying to escape hospital food. It was amazing, so fresh, and it brought me right back to our trip to Japan too many years ago. On one of our Duncannon visits we went for a picnic to Tintern Abbey, near the village of Saltmills, and no distance from where I grew up. While the historical aspects or the walled garden, both of which come highly recommended, weren’t of much interest to my small boys, they really enjoyed the walk in the grounds and a bit of exploring. Admission to the grounds is free. Donnelly Fresh Foods sent me a gorgeous selection of their fresh produce to try out including some fresh to wok quick meal ideas, I was pleasantly surprised at the prices too. The Caesar Salad really was excellent and everything tasted, so, well, fresh. I noticed Donnelly in the Aldi tent at the Ploughing Championships this year and realised their salads are in my shopping trolley every week. We spent lots of time this summer in local playgrounds at Duncannon, Courtown and Gorey, it’s great to see them so full of kids in the good weather, such a great free amenity. There’s a lovely new playground complete with zipwire opened in the new Le Chéile Park in Askamore, which is out in the hills between Wicklow and Wexford (but on the right side of the border) about fifteen minutes drive from Gorey. A great initiative by the community there, the playground in the park is imaginatively planned, very “explorey” and has lovely views of the surrounding hills. It’s also well in off the road, has lots of parking, picnic tables and a toilet, all practical points to recommend it. Don’t take my word for it, give a spin out there some day after school while it’s still bright, that’s what we did. Siobhan from Babypotz noticed how much I love them from my batchcooking post and sent me a box to replenish my stocks. Now all I have to do is fill them. The Kitchen restaurant in Gorey surprised me (and the girls) with a lovely bottle of prosecco to welcome our bumble of pink on a recent night out. What a lovely gesture. They’ve invited me to be their guest at their Cheese and Wine evening on Thursday 25th October- I can’t wait and will be sure to report back. Details on their Facebook page. This post contains products that were provided to me on a complimentary basis by businesses. Where this is the case I’ve stated it clearly (and thanked them). I’m only mentioning here as I did really enjoy the product, that’s how it works for me . Askamore Playground, Donnelly, Tintern Abbey, Wells House. Bookmark.